Fitness Class Descriptions | Tanya Gets You Fit, Inc. The use of barbell and weighted plates will be used for this class. You will be instructed through all major muscle groups by using the weight of the bar to lift, push and press through the fun, effective and challenging workout! If you are looking for a workout that will make you work harder than you ever have...TGYF Boot Camp is it! You will be challenged physically during each round of exercise in strength, endurance, agility and power. Circuit stations will be set up, as well as agility courses. Tabata protocol will be used each class to bring your body to muscle fatigue. Each class will be different, with new and exciting exercises! You must remember the old Step classes we use to take on the Reebok step!? This class is a new twist of a step class. Same basic step choreography, but on a BOSU! You will be working cardiovascular but also stability, balance and core strength! You will also be doing strength training and AB work on and off the BOSU throughout class. Cardio-Kickboxing is a cardiovascular workout using kicks, punches and combinations to elevate heart rate and strengthen all major muscle groups. You will be fighting off major calories while pumping up your body! Each class is choreographed a little different, leaving each workout fun and exciting. If you have padded gloves bring them along, but they are not necessary to have during the workout. What body part do 90% of clients want to work?! Their CORE! What is your core? Your core is made up of your abs, back and hips! Everything that helps stabilize your body!! This is a class that will target the hardest area to lose body fat. We will use Stability Balls, Gliding Disks, BOSUs and many more props to really target the hard to reach areas of your body! You will work on balance, stability and strength. Abs, Obliques, Back! Yes, you will work all of that in 30 minutes! You will use Stability Balls, BOSUs, Weights and much more for this workout! This class is great when paired with Express Sculpt, but can be just as good alone! This class is for the ADVANCE ONLY. This is for TGYF clients that have been doing bootcamp for atleast a year and have the knowledge and capability to do all the exercises to the highest progression. This class will be the next level for those looking to increase their strengths in all the physical components of exercise. Love cardio kick? Love getting your cardio done by doing a little Zumba? But you know how important strength and core training is right?! Why not get a little bit of everything in one class?! FAB FUSION FITNESS is Tanya’s brand NEW class! Sweat and get the heart pumping having fun while throwing some punches and getting a little jiggy with it! You will also be doing plenty of strength training that will help you build muscle, that helps you burn more fat! How could you miss such a great time? Are you new to fitness and don’t know where to begin? Are you an active older adult who needs an exercise program? This class is great for you! You will work on strength training and functional training to make you fitter and stronger. Modifications will be given for all fitness levels. Impact Boxing is a NEW class at TGYF! You will be working with gloves and mits in high intensity cardio segments and combinations. You will be punching, and kicking calories right out of you!!! YOU MUST BRING YOUR OWN BOXING GLOVES. I have some for sale, please contact me Tanya@tanyagetsyoufit.com . This class is designed for kids aged 6 – 12yrs. Your child will be encouraged to work together as they go through obstacle courses and exercise stations. Each station is a body weighted or cardiovascular interval. Each class will encourage team work and individual challenges. These medicine balls are 14 inches in diameter, the average width of your shoulder girdle, making all the passing drills more effective for your upper body. This is a killer workout where you will work with the ball doing passing drills working every part of your body! 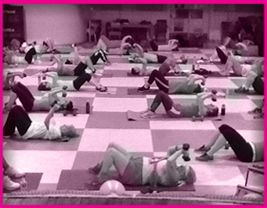 Everyone’s favorite is the end of class working your abs, oblique’s and lower back! Please join us for the madness! Pilates is a great way to achieve optimal strength, tone, flexibility and endurance without adding bulk. We take a contemporary approach to the mind-body teachings of Joseph H. Pilates, and emphasize neutral spine and neutral pelvic alignment and their relationship to core stability. Pilates is, however, much more than a "core" class.It works to restore the natural function of the spine and joints and balance the muscles. It also increases your body awareness and alleviates overuse issues. This stress-relieving method will be performed on a mat. Indoor spinning is an unbelievable workout experience. You will be taken through different riding terrains. Big mountains, flat speed rides, rolling hills. Each and every ride is never like the last and always challenging , but always manageable to finish and finish feeling successful. Spinning allows you to hold the resistance where ever you feel is beneficial for you. Your fitness goals will be met if you can get this class into your schedule 1x - 2x a week!! 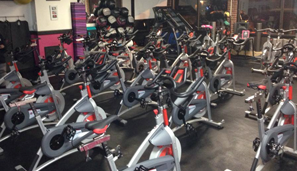 10 bikes are available to ride, please contact Tanya if you would like to reserve a bike for a class today! Spinning, but you decide, 30 minutes or the whole hour! This class is intended to concentrate on muscle strength and endurance. You will lift weights and work with body weight throughout the class. Guaranteed to work all major muscle groups to leave you feeling stronger than ever! This is a client favorite!! Total Body Blast is a total body workout that will challenge all major muscle groups by using cardio, strength, endurance, power and flexibility. You will be using Dumbbells, Tubing, Stability Balls and Gliding Disks in this class. Be ready to work hard from being to end, but feel stronger when class is over. Get your cardio and strength training done for the day with this new class. 30 minutes of Spinning followed by 30 minutes of a full body strength training routine! This is a GREAT class for someone who wants to try out spinning but is nervous about doing a full hour of it! You will get 30 minutes of an intense ride through different terrains, and then continue your workout off the bikes doing a full body strength training with dumbells, BOSUs and other equipment! This class is designed to be the perfect wake me up and get me ready for a full day of living kind of class. It will be the type of class where you feel like every inch of your body gets addressed. Parts of the class will be slow and deliberate, others will be faster and more challenging. We will focus on balance, core strength, flexibility, and deep breathing. A familiarity to basic standing and seated yoga poses is recommended. You MUST reserve your spot for all classes held at the TGYF Studio, sign up online. You can sign up for class up to 10 days in advance. Class specials and deals happen each month! Join our email list for updates! No reservation needed for any class, please arrive 15 minutes before class start time.